Theft is an issue facing healthcare facilities of all sizes. In senior living facilities, money and medications can be stolen—not to mention the problem of identity theft. Perpetrators can include employees, visitors, residents, or vendors. Without policies in place, it is difficult to prevent or even investigate these incidents. 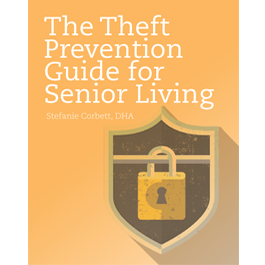 The Theft Prevention Guide for Senior Living provides tips and actionable advice about theft prevention in senior living facilities, with a focus on the areas most vulnerable to theft. Author Stefanie Corbett, DHA, aims to help operators and staff protect their residents from financial exploitation, as well as other forms of theft, through prevention and early intervention. Recognizing warning signs and building awareness among staff and residents is crucial in all residential settings. For over a decade, Stefanie Corbett, DHA, has served in various senior leadership roles in healthcare organizations. She founded a healthcare consulting firm based out of Charlotte, North Carolina, in 2014 to assist postacute care organizations with regulatory compliance and operations management. Prior to consulting, Corbett served as the deputy director of health regulation for the South Carolina Department of Health and Environmental Control, where she was responsible for overseeing the promulgation and enforcement of healthcare regulations at all licensed healthcare facilities and agencies across the state. In addition to working as an entrepreneur and in the public sector, Corbett has led postacute care organizations and taught as an assistant professor in healthcare administration programs at local universities.